MACULAR DEGENERATION is a disease characterized by loss of central vision from deterioration of the central retina (macula), which usually starts after the age of 65. The exact cause is not known. However, genetics, UV exposure, and tobacco are known risk factors. It is the leading cause of vision loss among patients 65 and older. 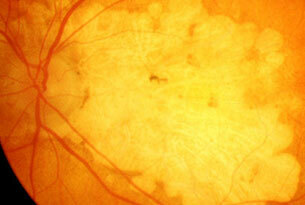 Patients may develop drusen, small, yellow flecks in the macula. These patients may experience blurred vision if the drusen degenerate further and turn into macular degeneration. 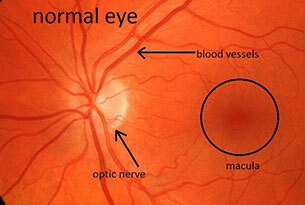 This blurred vision is due to retinal cell atrophy and is termed dry macular degeneration. 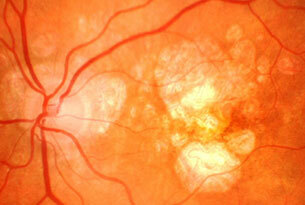 New blood vessels may grow underneath the retina, which can bleed and scar. This is called wet macular degeneration. Retinal Photography / Optos and Optical Coherence Tomography OCT are needed to properly diagnose and monitor for macular degeneration. We have all three at Skowron Eyecare. 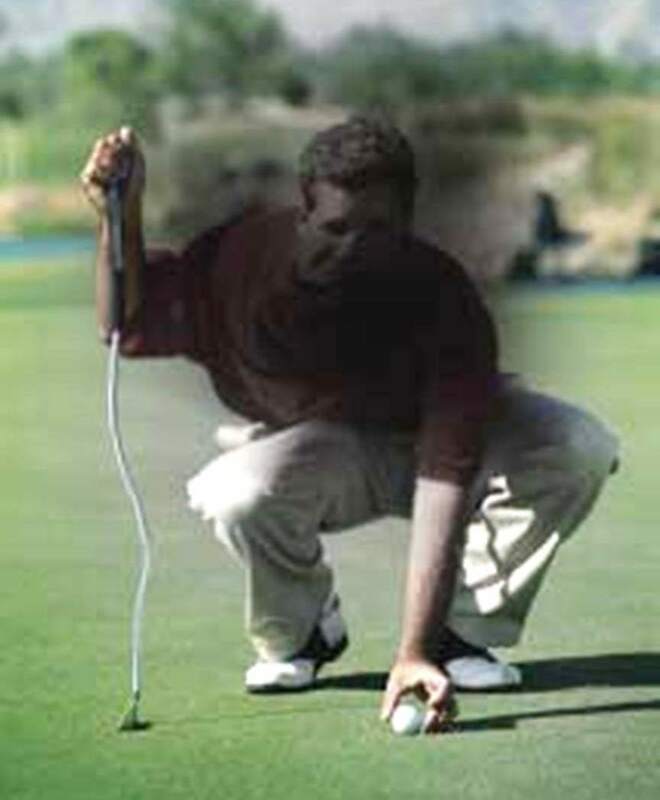 Retinal Photography / Optos will allow us to monitor and document any changes that present themselves on the surface. The OCT actually splits the eye into its layers and gives a cross-section view of the macula, enabling us to see changes very early that is occurring beneath the surface of the eye. It is imperative that these changes be detected and treated early for the preservation of the vision. The dry form is usually less severe. The progression of the disease is slower (years). The first sign may be the formation of small yellow flecks called drusen (SEE PICTURE). There is no actual treatment. Over the counter eye vitamins containing Lutein & Zeaxanthin have shown to slow progression. Eating dark greens and fish (particularly salmon) is very good at staving off Mac deg. To prevent from developing into the wet form, both office and home monitoring are used. Special magnifiers to aid vision can be prescribed. 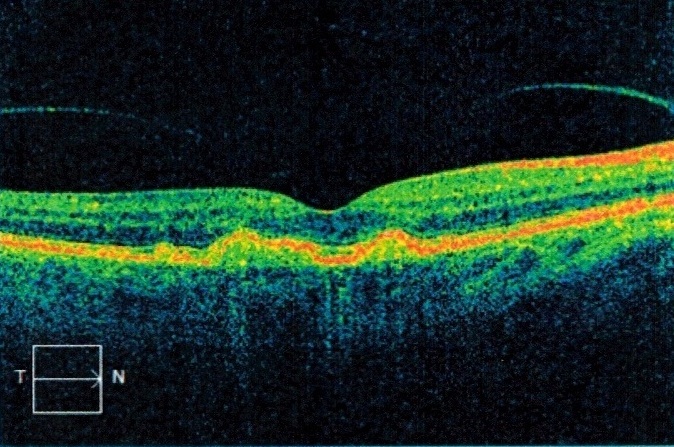 OCT is new technology that takes thousands of scans per second of the structures beneath the surface of the macula and optic nerve giving us the ability to diagnose and monitor diseases such as macular degeneration and glaucoma like never before. It affords us very early detection which gives a better prognosis once treatment is started. This technology is vital in detecting and monitoring AMD as it evaluates for changes beneath the retinal surface, where conventional methods would not be able to detect. Early intervention and treatment are essential if Dry AMD converts to Wet AMD (bleeding). The earlier treatment with injections of either Avastin, Lucentis, or Eyelea, the better the prognosis. The wet form is usually more severe due to bleeding. TREATMENT is usually monthly eye injections of Avastin, Lucentis, or Eyelea. The patient needs to be closely monitored both in the office and at home (with a special Amsler Grid chart). Special magnifiers to help vision can also be prescribed. Above: Vision in a person with AMD. Center and Right: Patients are given an Amsler grid for self-monitoring at home. All lines should remain straight. 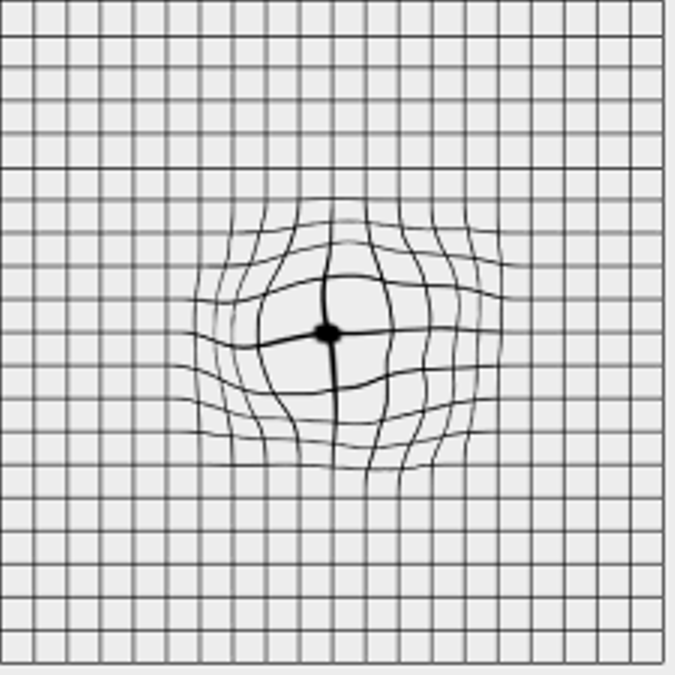 Crooked, distorted or changes in the lines could indicate a progression of macular degeneration. Prompt professional care is needed. 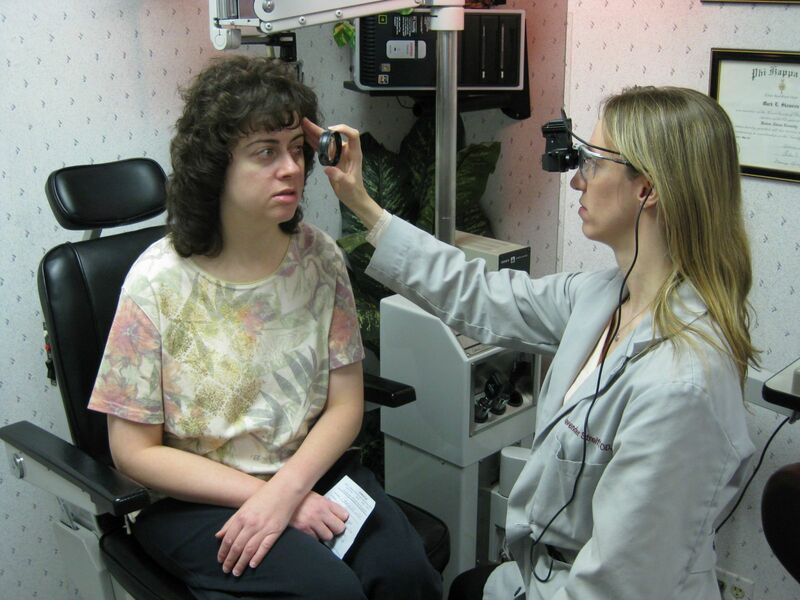 Patients 55 and older should be examined for signs of advanced macular degeneration (AMD) yearly. Eat a balanced diet rich in fruits and vegetables. 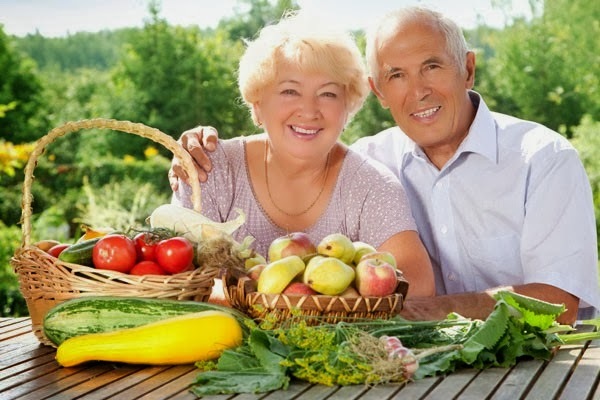 If signs of AMD are present, a combination of antioxidant vitamins and zinc may be helpful. Consult with your doctor to determine which is right for you. Smokers should not take supplements of beta-carotene as this can increase the risk of lung cancer. If outdoors a lot, wear a hat with a brim to avoid direct sunlight, and wear sunglasses with UV protection. 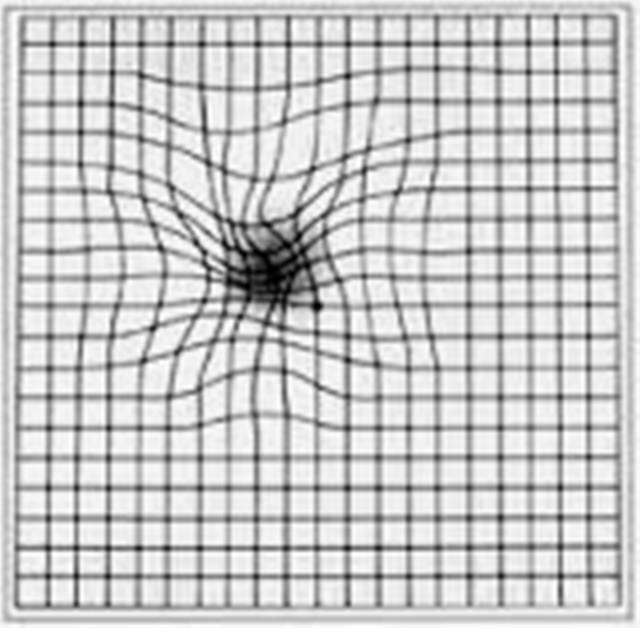 Patients are often given an "Amsler Grid" (PICTURE) for self-monitoring at home.